You may have had enough of Brexit, but 02 May 2019 will see both District and Parish Council elections. Milton has been split into two wards for both elections. One ward is south of the A34 (ie Milton Heights, Milton Hill and up to Rowstock). The other ward is north of the A34 (ie Milton village). District Council elections are more political with candidates standing for one of the political parties or as an independent. Only one councillor is elected for each ward. Parish Council elections are non-political and, although there should be 4 councillors for the ward south of the A34 and 3 for the ward north of the A34, all councillors work for the good of the Parish as a whole and not for any particular part. If more than 4 people stand for the south ward there will be an election. Likewise, there will be an election if more than 3 people stand for the north ward. Anyone wishing to stand should contact the Parish Clerk for more information. The deadline for handing nominations in to the Vale of White Horse District Council offices is 4.00pm Wednesday 03 April 2019. If more than the required numbers stand for election, the Notice of Poll will be published on Wednesday 24 April 2019. Voting, for both District and Parish Council elections, will take place on 02 May 2019 between 7am and 10pm, with the results being published on Friday 03 May 2019. 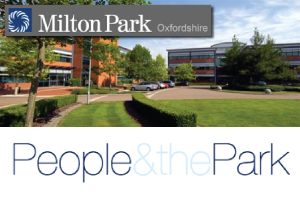 Full Milton Parish Council Minutes Can Be Downloaded. We have received OCC contractors' report and quotation to repair the bus shelters on the A4130 at Milton Heights. However, the bus routes may be changed to take into account the new housing at Milton Heights so it would be wrong to spend money repairing the bus shelters if they are to be moved or become obsolete. We therefore await definite information before deciding on which action to take. A salt bin has been placed beside the bus stop in High Street, to ensure access to the Church and The Plum Pudding remains clear in adverse weather. Matthew Homes have had a sign erected to stop HGVs travelling too far along Trenchard Avenue. We will continue to monitor the road where Thames Water has been working in High Street. However, anyone can contact 'Fix My Street' if they see this, or anything else, needing attention in the Parish. The more contacts will hopefully bring speedier results. OCC are still to erect the 'Children Playing' sign in Willow Lane. We took responsibility for the grass cutting in the Parish, within the 30mph limit. OCC were only cutting the verges once a year. We had 3 cuts last year but had requests for more. We are looking to increase to 4 cuts this year. St Blaise School is requesting the grassed area of land, adjacent to the school, be solely for Pre-school use. Access from Midwinter Avenue to the sports field would be maintained. The triangular area surrounded by Trenchard Avenue, Lambe Avenue and Midwinter Avenue could replace this as a fenced play area, which would be adjacent to the present playground. The Parish Council will be discussing this at the next meeting at 7.15pm on Monday 04 March at St Blaise School and hope parishioners will come and share their thoughts/views with us. Report on Parish Council Meeting held on 07 January 2019. Councillors are continuing to work towards the community building, although we are having difficulty accessing S106 money from the District Council. Until we have sufficient funds, we cannot appoint a consultant to take us forward. We have received the defibrillators and are making arrangements for installing them. 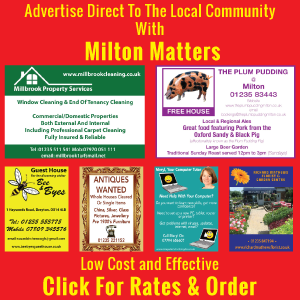 One will be at The Plum Pudding, and one at Milton United Football Club. We are still awaiting OCC's contractors' report but hope the bus shelters will soon be repaired. At present we have only 5 councillors, instead of the allocated 7. We invited all parishioners to meet us on 03 December and were very disappointed when only 2 parishioners joined us to see what we, as councillors, can and cannot do. Parish Council elections are being held on 02 May 2019, and anyone wishing to stand as a councillor, should contact the VWHDC or the Clerk for further details. There will be a 'Tree of Remembrance' planted in Blaise Park within the next few weeks, to remember all those who fought and, or, lost their lives in service of their country. We are endeavouring to have a salt bin placed behind the bus stop in High Street, to ensure access to the church and The Plum Pudding remains clear in adverse weather. The Councillors set the precept a little higher this year. However, this means our part of the Council Tax will increase by only a few pence per household. OCC have submitted plans to extend St Blaise School, and the Councillors have fully supported the application. The new roads, in the Matthew Homes development, have been named in accordance with the fruit orchards which were at Milton Heights. We are asking both Redrow and Matthew Homes to have signs erected to stop HGVs travelling too far along Trenchard Avenue. Our next meeting is in Milton Methodist Church on Monday 04 February, commencing at 7.15pm. Please come and join us.